Almond trees are small with large pink blooms in the spring, followed by a harvest of nuts several months later. They can suffer from fungal and bacterial infects, but are fairly resistant to serious problems caused by insects. The few bugs that are found in almond trees are usually not a threat to the life of the tree, and can be easily controlled with insecticides. Brown mites emerge in the spring concurrent with the opening of the leaves and buds of the almond tree. The eggs are red and are easily spotted in clusters on twigs. The young mites are also red. As they mature, they turn brown. The mites eat the leaves in the morning and hide during the hot afternoon sun, so look for mites in the morning if you suspect they are munching on your leaves. Small infestations will not harm your tree. Large infestations can cause the leaves to droop or turn yellow, but they rarely drop prematurely. Brown mites can be treated with an insecticidal oil sprayed onto the tree during the dormant season. Forest tent caterpillars appear in late spring. They and their nests are easily spotted on almond trees. The caterpillars are gray with yellow and blue stripes. The white webs of these bugs can coat large sections of the tree. The caterpillars consume the leaves. They are voracious eaters, and can completely defoliate a young tree in just one spring. They overwinter in eggs on the twigs. Prune away any infested branches or twigs if the infestation is limited to one small section of the tree. Use an insecticide to rid trees of large amounts of these caterpillars. In most cases, the caterpillars stick with one or two trees and do not spread throughout an entire orchard. Treat the tree as soon as you spot the newly hatched caterpillars. Leaffooted bugs are about an inch long and have leaflike protrusions on their hind legs. They feed on the nuts of the tree as they develop, which can kill the embryo of the developing seed. Leaffooted bugs also lay their eggs inside the hardening hull of the almond. Infected nuts become malformed or drop prematurely. Most damage occurs in March and April. 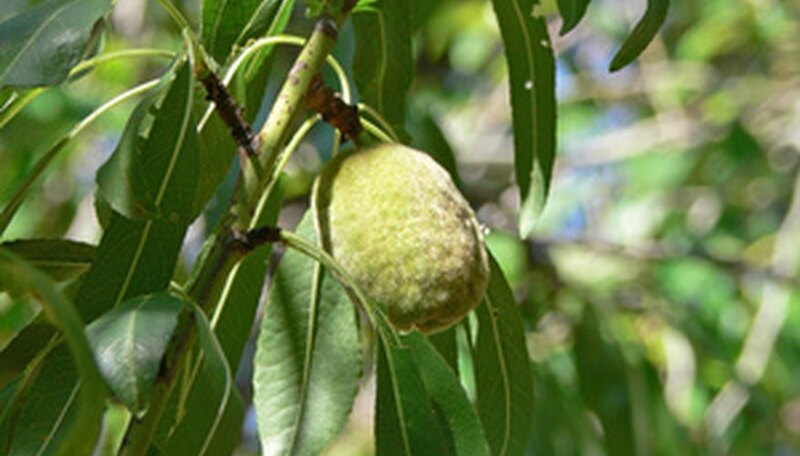 Leaffooted attacks on almond trees are relatively rare, but if they do infest your tree, you can kill them with an application of an insecticide, although this may not kill the eggs that are inside the nut. Nuts that have been infected may continue to drop from the tree for up to a week after you spray it.